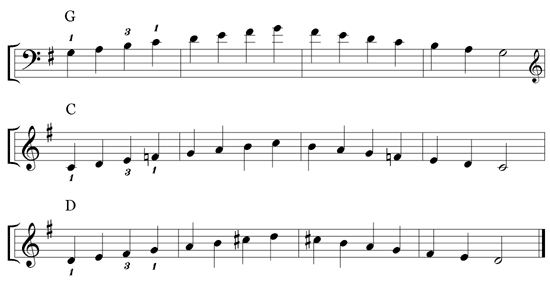 The diminished chord appears a lot in blues and twelve-bar music, but its simplest anadujd most common application is more melodic than harmonic. The diminished seventh chord is comprised solely of minor thirds stacked on top of each other. If you move the top three notes of the diminished chord up a semitone, you get a dominant seventh chord – the heart of twelve-bar music. This is the main reason the diminished chord appears so often in twelve-bar music. Here is a riff which uses the adjacent diminished seventh chords. Watch the teaching video, and listen to the aurio several times to learn to recognise the characteristic sound. This gives us a chance to revise the basics of twelve-bar harmony. 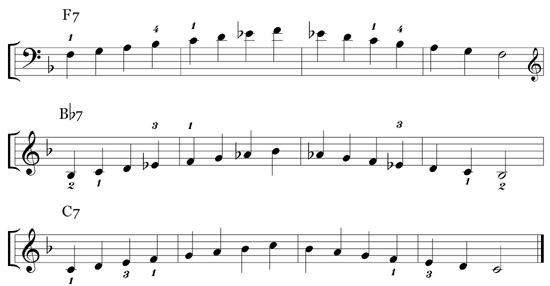 Blues and twelve-bar music mainly uses chords I, IV and V of the home key. The scale of G major shows us that in G, I, IV and V are chords G, C and D.
But twelve-bars use the flattened-seventh (dominant) scales built on those roots. We remind ourselves first of the major scales of G, C and D.
Then we flatten the sevenths to give us the three dominant scales we need. From these three scales, we pick the root, third, fifth and (flattened) seventh to give us the G, C and D dominant seventh chords. Dropping the fifth temporarily, we find the notes a semitone below the third and seventh, (these are as much of the diminished chord as we need) and practice alternating them with the seventh-chord third and fifth. This feature is the basis of the module riff. For the second chorus, we invert (downwards) the C and D third-and-flattened-seventh pairs and their diminished chord neighbours so they’re as close as possible to the G third and flattened seventh. Riffs often sound right in just one key on the piano and nowhere else. The study you have just learned – and the one that follows – sounds better in F, so we are going to transpose the riff down a whole tone. Here is the teaching video. The audio and MIDI reference files are indicated below. Transposing – learning and playing the same music in a different key – is the musical skill par excellence, and transposing this riff offers an opportunity to understand the ‘architecture’ of twelve-bar harmony even better. We repeat our build-up in the new key. Blues and twelve-bar music mainly uses chords I, IV and V of the home key, which in F are chords F, B¨ and C.
We remind ourselves first of the major scales of F, B¨ and C.
From these three scales, we pick the root, third, fifth and (flattened) seventh to give us the F, B¨ and C dominant seventh chords. 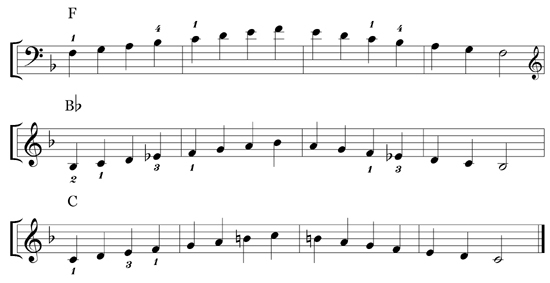 Dropping the fifth, we find the notes from the diminished chord which are a semitone below the third and seventh, (these are as much of the diminished chord as we need) and practice alternating them with the seventh-chord third and fifth. 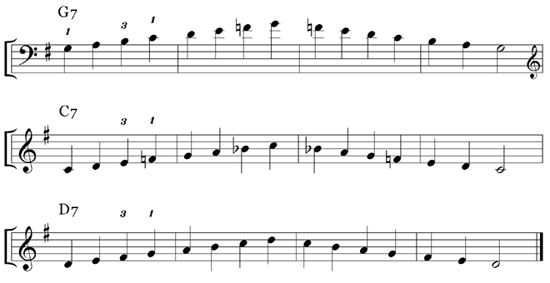 Here are the B¨ and C inversions for the second chorus.